For some people, myself included, dreaming of becoming a member of the royal family is a fairly regular occurrence. In Scotland, it’s easy to get carried away. Our magnificent landscape boasts many strong connections with royalty. For generations, the land has played host to many kings and queens, lived through several crowning moments, and it is openly known to be Her Majesty The Queen’s favourite holiday spot. So, if you want to act like a queen for a day, we can make your fanciful daydreams come true! Read on and discover the huge variety of royal-inspired activities that Scotland has to offer. You’ll want to tell the corgis all about it. The Palace of Holyroodhouse is the Queen’s official residence in Scotland, and is the former home of Mary Queen of Scots. Step inside Mary Queen of Scots’ Chambers – the setting for many dramatic episodes in the troubled queen’s short and turbulent reign. 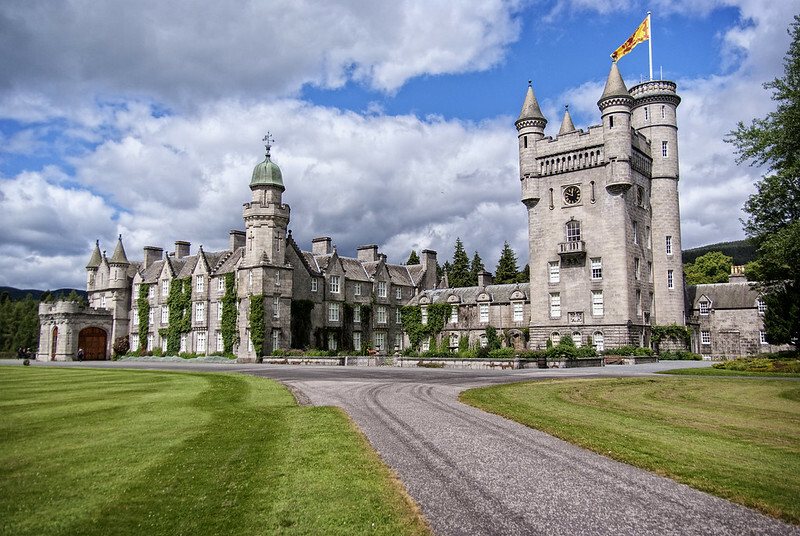 Balmoral Castle was a favourite with Queen Victoria, who described the estate as her ‘dear paradise in the Highlands’. Prince Albert purchased the castle for his queen in 1852 and it can still be visited when royals are not in residence. There is no more delightful a way to spend a summer’s afternoon than at the seaside, and coastal escapes have been enjoyed by the royals for centuries. From the pebbled stones scattered along the Angus coastline to the white sandy shores of the Hebridean isles, there are many different terrains to explore on foot. Take a break from your regal responsibilities and relax with a decadent high tea. At The Torridon, sit in the luxurious library with lochside views beside a roaring fire, or at the Balmoral Hotel, also known as ‘the grand old lady of Edinburgh’, you’ll find yourself surrounded by refined treats, irresistible canapés and scrumptious snacks. Just a short drive from Pitlochry in Perthshire, you’ll come across the jaw-dropping Queen’s View. It’s thought to be named after Queen Isabella, the 14th century wife of Robert the Bruce. Enjoy the panoramic views towards Loch Tummel and on clear days, see as far as the mighty mountains of Glencoe. Queens have been known for their intrepidness throughout the centuries, so now it’s your turn! Try an extreme sport this summer and test your limits. Tear along the beach in a land yacht, or conquer a fear of heights with a bungee jump at Nae Limits in Perthshire. Embark upon a memorable escapade with your partner in tow. Visit one of the oldest universities in the world at St Andrews, where the future king and queen met and fell in love during their studies. The picturesque coastal town is an idyllic backdrop for a fairytale romance. Wander through the medieval town centre, which consists of a series of narrow alleys and cobbled streets with quaint shops, elegant restaurants and seafront cafés. After all of this tomfoolery, you’ll have definitely earned a few hours of pampering. Treat yourself to a beautifying remedy, soothing treatment or massage at some of Scotland’s best spas and luxury retreats. Don’t forget, a queen must look her best at all times. Peruse the stylish designer boutiques in Edinburgh’s New Town or Glasgow’s Style Mile. Add a Scottish twist to your outfit by adding a corsage made from Harris Tweed or a fine cashmere scarf, and create a chic new look for your next big occasion. Your day would not be complete without some exquisite fine dining. Luckily, Scotland is primed and ready for your royal appointment with 12 Michelin-star restaurants dotted across the country. Tickle your tastebuds with the highly-acclaimed French cuisine of Restaurant Martin Wishart in Edinburgh or discover the contemporary menus at the Peat Inn in Fife. Have you had a royally fabulous time recently? Have you got a story that would amuse even Queen Victoria herself? Grace us with your honourable presence on our social media channels and share your pictures and comments with us.